BANGI, 2 Nov. 2010 – A chair for Malay Studies is to be set up later this month at the Hankuk University of Foreign Studies. It will be an upgrading of the Department of Malay Studies which is currently a part of the Indonesian Studies Department. Former Deputy Dean (Students and International Relations) Faculty of Social Science and Humanities UKM, Professor Dr Zaharani Ahmad, 54, has been appointed to the Chair for two years. Malay Studies Chairs have already been established in a number of other universities in the United States of America, China, Holland and New Zealand. The setting up of the chair will enable students and the people of South Korea to learn and understand Malay language, literature and culture better. Prof Zaharani said it would be a challenging assignment but was ready for it based on his experience in teaching Malay. 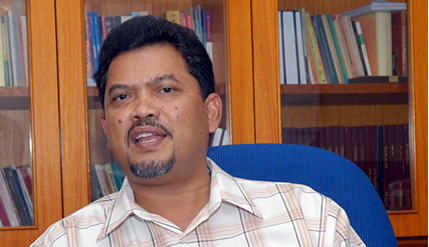 He was formerly a Malay language teacher before joining UKM as a tutor at the Linguistics Department in 1985. While at Hankuk University, he will give lectures on Malay Studies covering the language, linguistics, literature, history, geography, politics,economics, culture while also touching on Malaysia itself. He will also carry out research on all the subjects and collect materials on Malay Studies while also helping to prepare students to carry out research projects on Malaysia and give talks, organise seminars besides helping the university to strengthen its Malay Studies programmes. His other task is to help further strengthening understanding and co-operation between Malaysia and Korea through seminars, conferences, talks, exchanges of information, teaching staffs and students from institutions of higher learning. “I will help to develop and organise the Malay Studies Programme in Korea which normally takes in about 60 students including 20 post graduates while also asessing and if needed revising and improving the current programme at Hankuk University,” he said. He said that Indonesian literature and language was already available in Korean not only because some South Koreans had studied in Indonesia but many Indonesians have also made Seoul their home including a lecturer who had lived there for 15 years. Before leaving for Seoul, Prof Zaharani will undergoes a crash course in basic Korean language for one semester. He plans to bring with him books on Malay culture and language published by Dewan Bahasa dan Pustaka. While there, Prof Dr Zahrani will also be indirectly involved in ‘selling’ Malaysia to Koreans by promoting the country’s tourists attractions. Prof Dr Zahrani obtained his Bachelor’s degree (First Class Honours in Malay Language) from the University of Malaya in 1983 before getting his Master’s from University of Hawaii at Manoa, in 1988. Prof Zahrani got his PhD (Linguistics ) from the University of Essex in 1998.